Added April 12, 2019 from Geng Tan. Added February 21, 2019 from Geng Tan. Last night marked the official end of Spring Festival 2019. 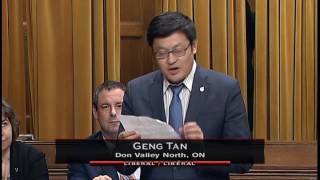 It has been heartwarming to see a noticeable increase in the number of Spring Festival celebrations across Canada since the spring of 2017 when the Government of Canada began proclaiming the first day of the Lunar Year as the beginning of the 15-day "Spring Festival, following unanimous passage of my 2016 motion. 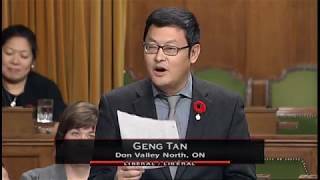 Added November 30, 2018 from Geng Tan. Added November 19, 2018 from Geng Tan. In 1960, North York residents came together to build a local hospital supported by Friends of North York General, I.O.D.E., Missionary Health Institute; and Volunteer Services. 3,000 volunteers raised over $3 million dollars. On March 15, 1968, an $8.6 million 70-bed community hospital opened at the corner of Leslie and Sheppard. Fifty years later, North York General Hospital (NYGH) remains one of Canada's leading community academic hospitals. Its emergency department saw 106,830 visits in 2016-17. Congratulations to the NYGH community for making a World of Difference since 1968. Added October 24, 2018 from Geng Tan. Added September 24, 2018 from Geng Tan. Many families from across Canada will reunite today to celebrate the Mid-Autumn Festival, a special day of togetherness with loved-ones and friends. 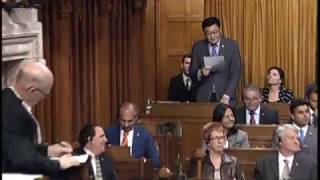 It is an opportunity to champion the benefits of a vibrant multicultural Canada, where diversity is our strength. 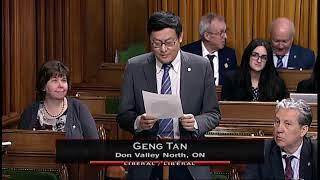 It is also a chance to celebrate the many contributions made by Asian Canadians, whose culture, traditions and heritage enrich the lives of all Canadians. Added June 27, 2018 from Geng Tan. 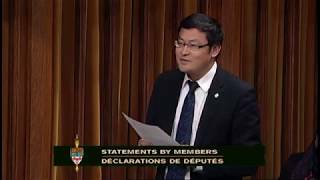 MP Tan has tabled a petition in Parliament, calling on the Government and the National Seniors Council to support the creation of a time bank system in Canada. Added June 8, 2018 from Geng Tan. Added May 10, 2018 from Geng Tan. 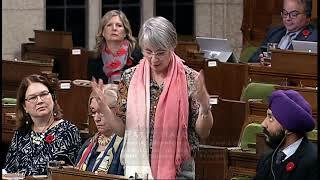 Statistics Canada predicts that, by 2031, nearly one in four Canadians will be over 65. This is similar to the demographic challenge facing countries like Japan today, as the world's oldest country. A “time bank” would help address additional social needs faced by many of our seniors. Typically a time bank offers services needed by people who are older or who have disabilities, including: friendly visits, telephone companionship, shopping, transportation, minor home repairs, computer help, assistance with paying bills, relief for family caregivers, and peer counseling. We all have something to give and volunteer work should be honored, recorded and rewarded. 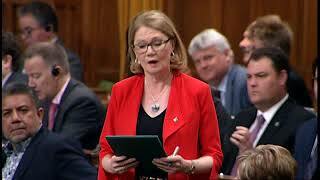 Therefore fellow Parliamentarians are urged to support the introduction of a “Time Bank” system in Canada, like the one in Switzerland, to encourage more people to provide unpaid help to seniors in Canada by allowing the volunteers to bank their time. Added April 11, 2018 from Geng Tan. Added February 28, 2018 from Geng Tan. 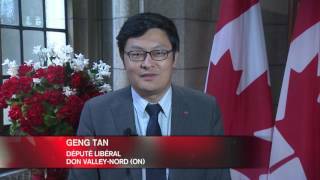 During the Spring Festival, Canadians of Asian heritage across the country celebrate another year of growth and prosperity. 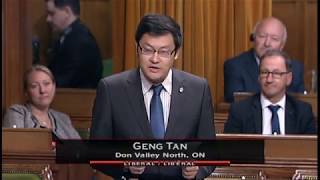 The Spring Festival is a great opportunity for all Canadians to come together and learn more about their neighbour’s heritage and culture. 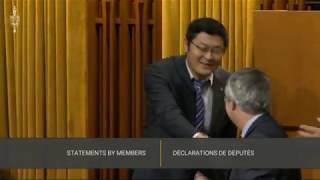 Multiculturalism makes life better for all Canadians and helps to build strong, diverse communities. 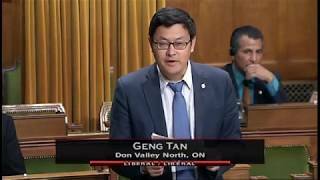 As we gather with friends and family, I invite everyone in Don Valley North to participate in their local community's Spring Festival celebration. Added January 8, 2018 from Geng Tan. Added September 27, 2017 from Geng Tan. Our government understands that we need science and evidence to make the best decisions about the things that Canadians care about most. The previous Conservative government fired the Chief Science Advisor and undermined the importance of science when making decisions. 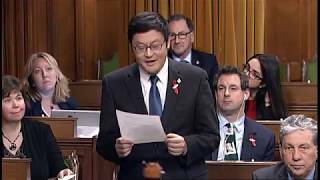 They discouraged scientists to share with Canadians their important work, closed government science libraries and as a result, it was harder for scientists to research topics like climate change. We are changing that. 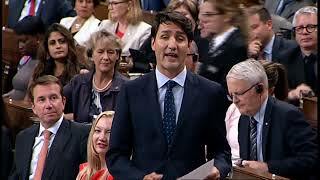 Today, it was my honour as a scientist to rise in the House and ask the Prime Minister what our government is doing with the important role of Chief Science Advisor and to restore science back in Canada. Added July 1, 2017 from Geng Tan. Truly blessed to celebrate #CanadaDay with some of our newest Canadians here in Don Valley North and thank you to everyone who joined me on our country's 150th anniversary! 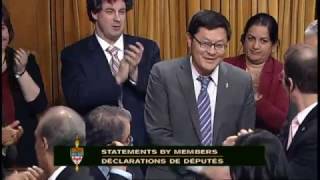 I am excited as we work together towards making the next 150 years in Canada even better. Happy Canada Day! Added June 16, 2017 from Geng Tan. Added May 5, 2017 from Geng Tan. 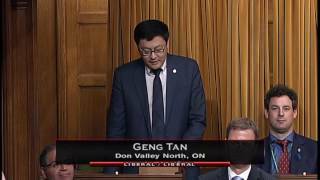 On May 2, 2017, I rose in the House to speak on Asian Heritage Month. 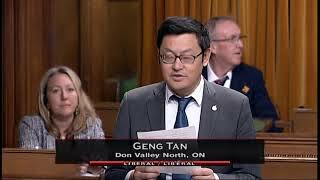 This month, I would like to encourage everyone in Don Valley North to take part in celebrations of Asian culture and to learn more about the contributions of Canadians of Asian origin. Added February 27, 2017 from Geng Tan. Last year, we helped over a hundred people with preparing and filing their personal income tax. It is my pleasure to announce that this free service is once again available at my constituency office for those who have a modest income and a simple tax situation. 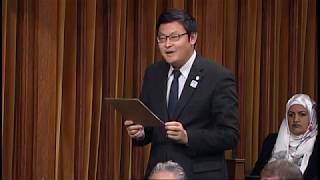 For more information or to book a session, please call my constituency office at (416) 443-0623. Added January 31, 2017 from Geng Tan. 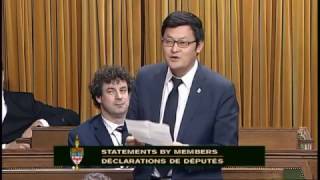 On January 30, 2017, I made a speech in the House on bill C-36, An Act to amend the Statistics Act. 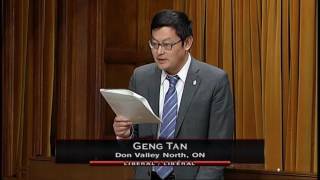 On January 30, 2017, I made a statement in the House on Spring Festival Celebrations taking place across the country. 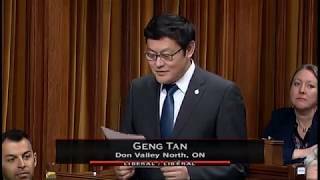 It is the first Spring Festival since the passing of my motion last June officially recognizing the beginning of the Lunar New Year as the start of the Spring Festival. Happy Chinese New Year! Added January 17, 2017 from Geng Tan. 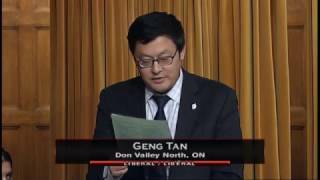 Every year, Asian communities across Canada mark the beginning of each Lunar Year with the Spring Festival. This festive event lasts for fifteen days and is celebrated by millions of Asians around the world. 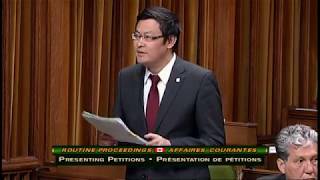 On June 1, 2016, I had the privilege of introducing a private member's motion that seeks to recognize the Spring Festival in acknowledgement of the many gatherings that take place in communities across the country and, as well, to recognize the contributions of people of Asian heritage to Canadian society. © 2019 Geng Tan. All rights reserved.